As a “blogger”, I’ve “met” a lot of new people. Some local, one as far away as Scotland. One of the bloggers that I follow is an outdoor champion. She hikes all the hikes in the PNW and I’m always so envious of her photos. You can check out all of her hiking adventures here. 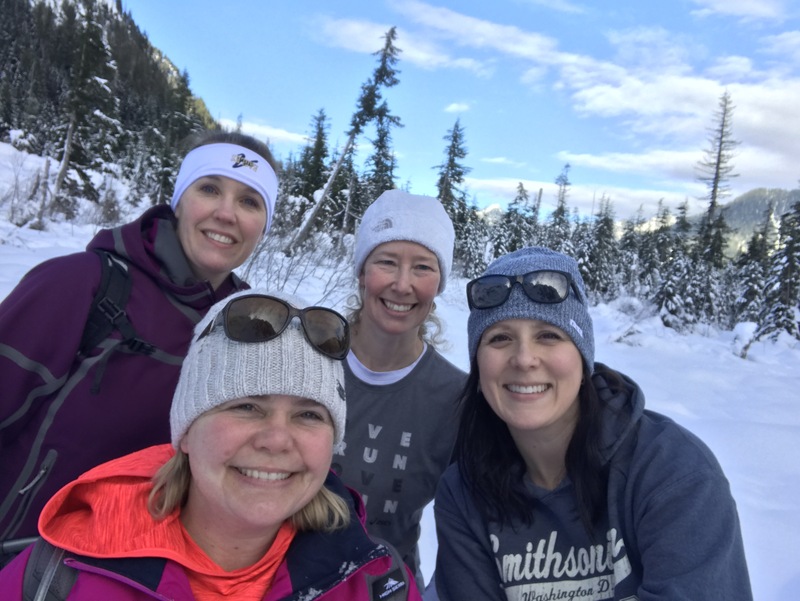 In December, she posted a photo to her instagram of this gorgeous snowy view and that is how snowshoeing made the list. I reached out to her and asked where to go and I can’t wait to check out The Lower Gold Creek Basin, but since we are all North-enders we opted for a North Cascades option closer to home. Voni driving = much better plan. I brought the selfie stick. And I stopped to take pictures. A lot. One person may or may not have predicted a fall…that may or may not have happened two minutes after the prediction. We snowshoed the crap out of that trail. But we really didn’t need the snowshoes. In fact, I’m pretty sure we made it much harder on ourselves. Or we just made it a better workout. Yeah…we’ll go with that. We saw people in tennis shoes, rubber boots, cute little hi-top converse, shorts and even two dudes on bikes. Say what??? The beautiful views. Have I mentioned how gorgeous Washington State is? I mean, seriously. We ate lunch (while freezing our butts on the ice) while a couple flew their drone above our heads. Trekking our way to 21,000 steps and 7ish miles was definitely a bonus (and gave me the excuse to plant myself on the couch in front of the tv for the rest of the afternoon). My adventure team: Voni, Megan, and Marla. Thanks ladies for the experience, the conversation and company. And the beautiful and peaceful adventure (well, except for how loud the snowshoes are…man did we really clomp and crash and trip our way along the mountain). Is snowshoeing supposed to be graceful? Hmmmm…. I used that same excuse to plant myself on the couch too.